« Open to Anything: Splashdowns! This small-in-the-frame Common Nighthawk image was created at Indian Lake Estates with the with the Canon EF 600mm f/4L IS II USM lens, the Canon 2x EF Extender III (Teleconverter), and the Canon EOS 5D Mark III. ISO 800. Evaluative metering +2/3 stop: 1/160 sec. at f/9 in Av Mode. Central sensor Expand (by necessity)/AI Servo/Rear Focus on the bird’s eye and re-compose. Click here if you missed the Rear Focus Tutorial. Click on the image to see a larger version. This, the small in the frame version, was my favorite by a mile. On July 11, while I was in the Galapagos, “Can Less Be More?” was published. I asked, “Which image do you like best? I made the small-in-the-frame image before I approached more closely to create the image that opened that blog post. Please leave a comment and let us know which of the two images you like best. And why? While the larger in the frame image would be best for a field guide, there is no doubt in my mind that the small in the frame image is much more pleasing to the eye, and thus, a much more successful photograph. And besides, I like it best by far. 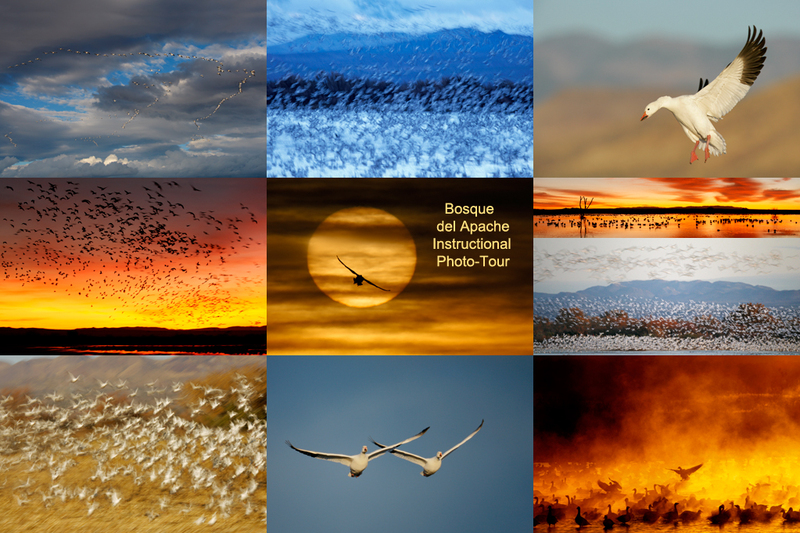 When I first began photographing birds my great desire was to create “full frame” images. I quickly learned that stuffing the bird in the frame with the bill tip against one frame edge and the tail tip against the other frame edge is not the way to go. Birds need room in the frame. They need to be able to see into their worlds, to have a place to go. That is why we place the birds back in the frame when working in horizontal format. In The Art of Bird Photography II I suggest that the longest dimension of the bird should never take up more than 3/4 of the frame. This white morph Red-footed Booby image was created with the Canon EF 200-400mm f/4L IS USM Lens with Internal 1.4x Extender (hand held at 381mm) and the Canon EOS-1D X. ISO 800. Evaluative metering +2/3 stop: 1/160 sec. at f/4. Two sensors above and one to the right of the central sensor/AI Servo-Surround/Rear Focus AF on the bird’s neck active at the moment of exposure. Click here if you missed the Rear Focus Tutorial. This was one of the very first images that I made on what turned out to be a magical morning. White morph red-footeds make up less than 5% of the population. In the July 19th blog post, “Beginning of a Love Affair with the Canon EF 200-400mm f/4L IS lens: Day 2 Darwin Bay, Tower Island am-Part I,” I asked folks to let us know their favorite images. I believe that all of the images garnered at least a single vote. My two favorites were the two white-morph Red-footed Booby images, the one with the cactus background (above) because of the beautiful image design and excellent post processing (he said modestly). I ran Detail Extractor on the cactus and punched up the YELLOWs and GREENs to highlight the cactus. 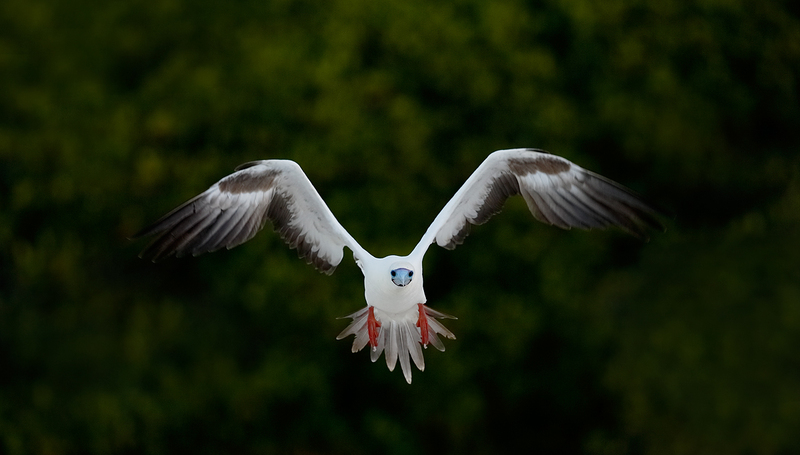 On the flight image (below) I love the sharpness, the wing position, the splayed tail, and those piercing eyes. This white morph Red-footed Booby image was created with the Canon EF 200-400mm f/4L IS USM Lens with Internal 1.4x Extender (hand held at 325mm) and the Canon EOS-1D X. ISO 800. Evaluative metering +1 1/3 stops off the grey sky: 1/1000 sec. at f/4. Central sensor/AI Servo Surround/Rear Focus AF on the bird’s face active at the moment of exposure. Click here if you missed the Rear Focus Tutorial. Click on the image to see a larger version. Denise Ippolito and I are heading out to dinner in Rockville Centre in a few. We meet the group for the sold-out Nickerson Beach Baby Beach-nesting Birds IPT at 7pm sharp. We are looking forward to putting on a great workshop. Scroll down here for details on the Saturday seminar that Denise Ippolito and yours truly are doing in Chattanooga on October 12, 2013 and the follow-up Old Car City In-the-Field Workshop. 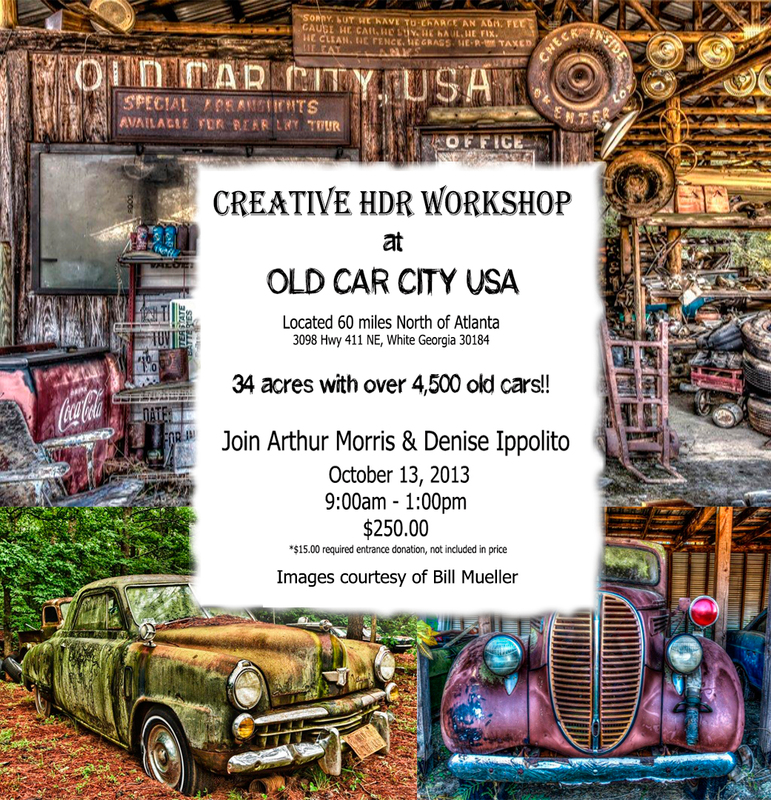 Blog folks who sign up for both are invited to join us at a secret Urbex location in Atlanta on Friday morning October 11. Feel free to e-mail me for details after you are registered for both. Bosque del Apache 2013 IPT: “The Complete Bosque Experience.” NOV 26-DEC 2, 2013. 7-FULL DAYS: $3399. Co-leader: Denise Ippolito. Introductory Slide program: 6:30 pm on 11/25. Limit: 12. This trip needs 8 registrants to run so please do not purchase your plane tickets until you hear from us; right now we need 5 more folks. 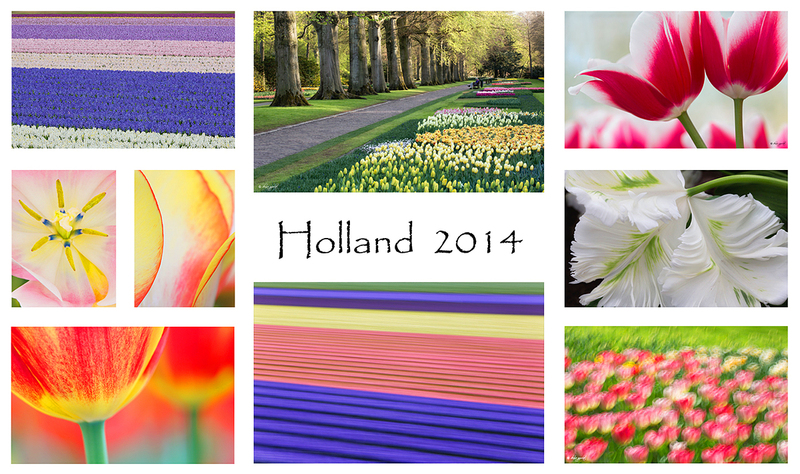 Join Denise Ippolito, Flower Queen and the author of “Bloomin’ Ideas,” BPN Photo Gear Moderator, former Nikon shooter, and technical expert Peter Kes, and Arthur Morris, Canon Explorer of Light and one of the planet’s premier photographic educators for a great trip to Holland in mid-April 2014. Day 1 of the IPT will be April 17, 2014. We will have a short afternoon get-together and then our first photographic session at the justly-famed Keukenhof. Peter who is originally from Holland, will be our local guide/interpreter/driver. Most days we will return to the hotel for lunch, image sharing and a break. On Day 8, April 24, we will enjoy both morning and afternoon photography sessions. For those who will be bringing a big lens we will likely have an optional bird photography afternoon or two or possibly three. The big attraction should be gorgeous Purple Herons in flight at a breeding marsh. We would be photographing them from the roadside. And we might be able to find a few Great-crested Grebes at a location near Keukenhof. White, Georgia: $250 plus a $15 entrance fee donation (cash only on the day of the event) that will go to charity. Limit: 16 photographers. Everyone buys something from Amazon, be it a big lens or deodorant. Support the blog by starting your search by typing in the little white box below. No purchase is too small to be appreciated; they all add up. Why make it a habit? 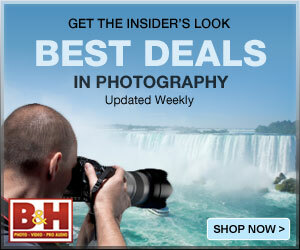 Because I make it a habit of bringing you new images and information on an almost daily basis. Hey Artie! One of the things I have learned from our last IPT together is that I tended to frame too tight, and today I see very well the value of taking a wider approach. I agree that the wider shot is much better on the Nighthawk. Very well done!! We Brits have always preferred habitat detail in the Background to give a complete picture – although there are, of course, perfectly valid reasons for the simple ‘bird on a stick’ clean BG images. It all depends on the reason for taking the photograph and its possible usage. 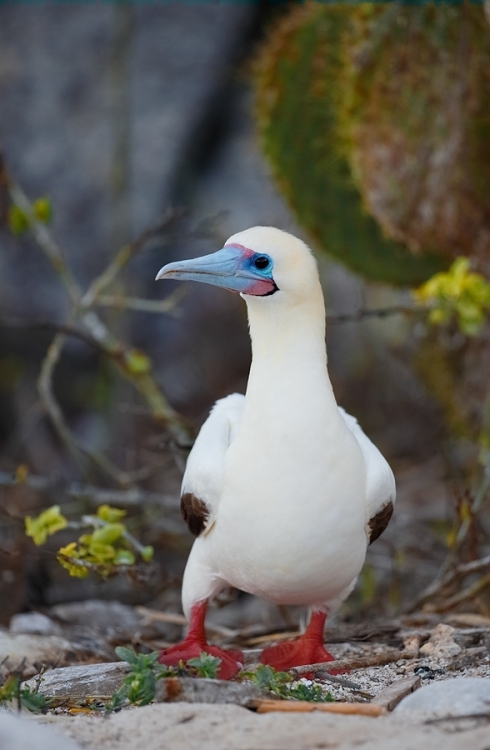 The Red-footed Booby and cactus is a superb image. The soft light (and your editing of course) has rendered the subtle tones in the white plumage beautifully, but the shape, facial colours and general ‘attitude’ makes sure that the bird stands out well from the BG. I would have toned down, not removed, the pale stick below the birds bill using a 50% clone stamp and slightly toned down the yellow flower on the right. Well, it is easy to make suggestions in retrospect, and you did ask!!! ‘Looking forward to more super Galapagos images. When uttered by most Brits, Europeans, and Japanese, the phrase “simple bird on a stick clean background images” is often used disparagingly. And in most of those cases the folks uttering those words are not capable of creating a single decent image that would fit in either category. Please don’t take my comments too personally as I have seen a few good images of yours over the years. As far as your suggestion for additional image clean-up I am sure that you realize that nearly all Brits, Europeans, and Japanese would castigate you for just having those thoughts much less stating them in a public forum. I am fine with the yellow leaves (not flowers) on the right.